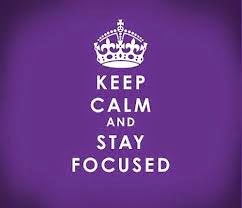 "Keep Calm and Stay Focused" is something I keep repeating to myself more recently. I've had the same goal since July and it's starting to become one of the most frustrating parts of my fitness journey. I have weeks I do really well, and then it seems the next week or two I struggle. I know I'm making some type of progress, because I'm getting comments at how much slimmer I'm looking and I'm actually noticing the changes as well when I look in the mirror. The issue for me is I still have a weight loss goal that I just can't seem to hit. A couple weeks ago I was so discouraged I was on the verge of telling Michael I needed a break and was going to tell him I wanted to take the month of October off. But, I knew that wasn't the answer, and I also know what he would say if I came to him with that information. So, I sucked it up, had my meltdown once again, and with Michael's help making adjustments in my workouts, cardio, and meals I'm really focused on my goal. It's the same goal, to get below 200, and as Michael said no more roller coaster rides and I have until Thanksgiving to hit this goal. It'll be hard, but it's doable. The frustrating part once again, is last week I lost over 7 pounds after the changes, but then this week I gained 1.8. And like Michael said, that could be water weight, but frustrating nonetheless. I'm hitting it hard in my sessions, and today for some reason when I went back for the lunch workout I was really having a hard time staying positive. I keep thinking about all I'm putting in, the sweat, pain, tears, and hard work into my workouts, getting an additional hour to two hours of cardio a day, and following my meal plans as written, but seems like I'll never get to my goal. Now, after I did the lunch workout, went back to the office, I started feeling a little better. And in reality, despite that I feel like I'm never going to meet my goal, I know differently. I know if I stay focused on my goal, be persistent and never give up, I'll get there! I want to thank Michael, my friends, family, and my FT family for always being there when I need the support and encouragement the most. Without each of you I would have given up a long time ago, and wouldn't be as successful as I am today.